The Floodplain Management Section of the NJDEP, Bureau of Dam Safety and Flood Control is divided into three main units consisting of the Flood Risk Mitigation Unit, the Flood Risk Analysis Unit, and the Community Assistance Program Unit. The Floodplain Management Section also includes the office of the NJ State NFIP Coordinator, which is responsible for coordinating NFIP program aspects of floodplain management throughout the State. The major goal of our the Flood Risk Mitigation Unit is to implement flood protection and control measures to protect life and property in New Jersey from the devastating effects of flooding. This includes both large federal and smaller state flood reduction projects. Federal Flood Control Projects. Coordinate and assist the U.S. Army Corps of Engineers (USACE) in the planning, design and construction of flood protection projects by obtaining all required State approvals and permits for the project designs. Schedule and attend meetings with the USACE, county and local government officials, and citizens group. Conduct field reconnaissance and surveys for and with the USACE, as necessary, in the planning and construction of flood protection projects. Review of economic analyses and engineering designs including hydrologic, hydraulic, structural reports and, construction plans and technical specification documents. Prepare applications and obtain all necessary State approvals and permits (LURP-SEP, IP; NJDOT; NJ Transit; Landfill Disruption; Site Remediation; Historic Preservation; Fish & Wildlife; Green Acres) required for USACE flood protection projects. Monitor and inspect USACE flood protection projects during and after construction to assure that project facilities are constructed and maintained in accordance with plans, specifications and operation manuals. State funding for these federal flood control projects is through annual state appropriations under the HR-6 Flood Control project budget. Annual state flood control funding is used to match federal funding to the USACE, for annual operation and maintenance of existing flood control projects and for project administration. State Flood Control Projects. Coordinate and assist local government entities in entering into cost share grant agreements with the Department and administer the grant agreements. Coordinate planning and construction of local flood control projects and assist in obtaining all required State approvals and permits for the project designs. Schedule and attend meetings with the local government officials and citizens groups. Conduct field reconnaissance and surveys for and with the local government entities, as necessary, in the planning and construction of flood protection projects. Review of economic analyses and engineering designs including hydrologic, hydraulic, structural reports and, and construction plans and technical specification documents. Monitor and inspect state flood protection projects during and after construction to assure that project facilities are constructed and maintained in accordance with plans, specifications and operation manuals. The "Dam, Lake, Stream, Flood Control, Water Resources, and Wastewater Treatment Project Bond Act of 2003"' P.L. 2003 C,162, provided $25,000,000 for grants to implement state and local flood control projects. The Bureau of Dam Safety and Flood Control solicited and received applications for these grants. An appropriations bill (P.L. 2005 c.231) was approved for these projects. The “Dam, Lake, Stream, Flood Control, Water Resources, and Wastewater Treatment Project Bond Act of 2003”’ P.L. 2003 C,162, provided $25,000,000 for grants to implement state and local flood control projects. The Bureau of Dam Safety and Flood Control solicited and received applications for these grants. An appropriations bill (P.L. 2005 c.231) was approved for these projects. Historically, New Jersey has taken a strong role in the development of a rigorous floodplain management program at the State level while supporting those same efforts at the Federal level with the Federal Emergency Management Agency (FEMA). In 1929, N.J.S.A. 58:1-26 authorized a state agency to regulate structures within the natural and ordinary high water mark. In 1962, a second law N.J.S.A 58:16A(50-54), was adopted authorizing the Division of Water Policy and Supply, to study flood plain areas and to delineate such area by resolution. In 1972, the legislature adopted a third statue amending the 1962 Act which authorized the Division of Water Policy and Supply to delineate and mark flood hazard areas and to adopt regulations for these areas. Under the 1972 Act, N.J.S.A. 58:16A (50-66), the Department is authorized to adopt Floodway regulations and to promulgate minimum standards for local rules and regulations concerning development in Flood Fringe areas. The Division of Water Policy and Supply, now the NJ Department of Environmental Protection was authorized "to adopt land use regulations for the flood hazard area, to control stream encroachments, to coordinate effectively the development, dissemination, and use of information on floods and flood damages." The state's approach to effectively providing this information was to develop flood hazard area maps. The New Jersey maps predated the Federal maps and indicate the special flood hazard area or 100-year flood and the floodway that the Federal maps eventually showed but also delineates the New Jersey Flood Hazard Design Flood, based on discharge 25% larger than the 100-year flood discharge. As these maps preceded similar efforts at the federal level, they help demonstrate the history and depth of the State of New Jersey's commitment to flood plain management. FEMA is currently in transition from their Flood Map Modernization Program (Map Modernization) to Risk Mapping, Assessment and Planning (Risk MAP). The Map Modernization program began the work of conducting a large-scale overhaul of existing paper flood hazard maps. Risk MAP will provide communities with flood information on a watershed basis and tools they can use to enhance their mitigation plans and better protect their citizens. Through more accurate flood maps, risk assessment tools and outreach support, Risk MAP builds on Map Modernization and strengthens local ability to make informed decisions about reducing risk. As part of Risk MAP initiatives, a suite of flood risk products will be developed for this project, including: a flood risk report to provide stakeholders with a comprehensive understanding of flood hazard and risk exposure within their community and watershed; a flood risk map that depicts county and community boundaries in relation to areas of risk within the study area; and a flood risk database that will be the primary source to access information collected and developed during the flood risk assessment process. Additional products that may be included that will be useful to municipalities, homeowners, emergency management offices, and insurance companies are a summary of changes to the new FIRM (flood insurance rate map) since the last FIRM; flood depth and analysis grids; flood risk assessments; and the identification of areas of mitigation potential. 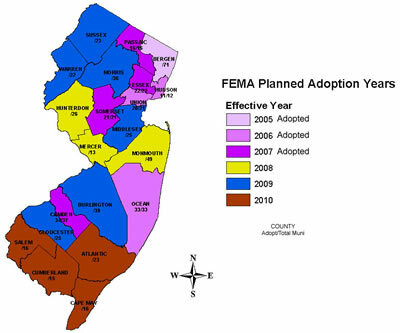 In 2006, the NJDEP and FEMA signed a Cooperating Technical Partnership Agreement (CTP) to perform map production working together with FEMA to build next generation of FEMA and State flood mapping. New Jersey will continue to take the lead in prioritizing projects, coordinating available data sources and conducting the outreach; all essential components in the data production and map adoption components of the program. Moving forward, NJDEP will be developing new floodplain data, producing Digital Flood Insurance Rate Maps (DFIRMs) and post-preliminary processing. New Jersey will integrate its mapping program with the FEMA program. This integration hinges on creating FEMA FIRMs for New Jersey, which delineates the New Jersey Flood Hazard Area (NJFHA). The flood hazard area, computed by using 100-year discharge plus 25%, may be simply a digital layer, but it is the state's regulatory standard. Currently, because FEMA FIRMs do not have this data, the state is bound to maintain and update its own state maps each time FEMA updates its maps. This is an arduous process and necessitates some duplication of effort. By including the NJFHA on the DFIRM, the state would be able to use the FEMA DFIRMs as the single source for both Federal and state flood plain management, freeing up staff resources and increasing efficiency. Our office provides floodplain management assistance to local communities throughout the state through our National Flood Insurance (NFIP) Community Assistance Program. The Legislature of the State of New Jersey has in N.J.S.A. 40:48-1, et seq., delegated the responsibility to local governmental units to adopt regulations designed to promote public health, safety, and general welfare of its citizenry. The New Jersey Department of Environmental Protection is designated as the State agency responsible for coordinating Federal, State and local aspect of flood plain management activities as required under the provisions of the National Flood Insurance Program. 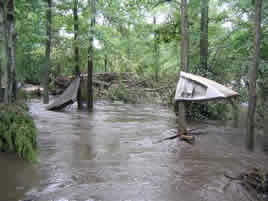 The goal of the National Flood Insurance Program (NFIP) and of the New Jersey Department of Environmental Protection (NJDEP) is to reduce threats to life and property through improved flood hazard information, enforcement of flood damage reduction regulations, and promotion of flood damage reduction activities including, and also exceeding, minimum NFIP standards. The challenge is to provide appropriate outreach in a State with 549 municipalities in the Regular Program. NJ is the number five state in the nation for the number of flood insurance policies. The New Jersey Department of Environmental Protection currently carries out its responsibilities under the Community Assistance Program with its current Floodplain staff within the Bureau of Dam Safety and Flood Control. New Jersey has 566 municipalities with 549 participating in the National Flood Insurance Program. Maintaining an understanding of the requirements of the NFIP in each of these municipalities presents a considerable challenge, particularly when there is a high turnover rate among local floodplain administrators. The program goal is ideally to reach out to each NFIP participating community over a five-year cycle through CAVs, CACs, workshops and technical assistance contacts. Community Assistance Visits. CAVs are the most in depth form of contact with a local community. Because of limited staff we try to coordinate joint CAVs with Region II in municipalities with repetitive losses, high numbers of policies or losses, with new or proposed new development, with new floodplain administrators, and with known floodplain development problems. The municipalities requiring a CAV are developed through negotiation with FEMA Region II, according to the standards mentioned above. When flooding occurs, it becomes necessary to revise priorities in order to visit flooded communities. Community Assistance Contacts. CACs are short visits or telephone interviews. Sometimes a CAC results from a site visit to provide assistance with respect to specific development. Other times, they are targeted to communities that have not received an NJDEP or a FEMA contact in some time. General technical assistance contacts often become CACs due to the time spent assisting a community with a project. Local Ordinance Assistance. New Jersey municipalities must formally adopt new and revised map panels and Flood Insurance Studies in order to legally enforce NFIP requirements. Due legal process requires that a community have a public process to adopt and enforce a Flood Insurance Rate Map and Flood Insurance Study. This requires communities to formally adopt by ordinance any new or revised map panel or Flood Insurance Study that affects land within its jurisdiction. To assure that New Jersey municipalities maintain the legal ability to enforce NFIP development requirements, the NJDEP works with local communities to help them maintain local laws that are compliant with NFIP regulations. In particular, NJDEP provides local municipalities with a model local ordinance and map adoption language, and reviews local ordinance amendments and replacements. Workshops and Other Training. We provide an average of two technical workshops per year on NFIP issues. Most workshops are five-hour introductory level NFIP workshops for local code officials. General Technical Assistance. One of the most important things the State does to support the NFIP is to provide technical assistance to local officials, property owners, developers, architects, engineers and surveyors with respect to development in a Special Flood Hazard Area. 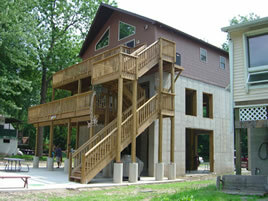 Such assistance results in development which is more flood resistant, and which is compliant with NFIP standards. Technical assistance contacts range from ten-minute telephone calls to detailed technical assistance on a project that can take days of staff time. Often a workshop results in a sudden increase in calls from community officials who now have learned enough about the NFIP that they want to call for additional information. Assistance to Communities to join the CRS. Residents of New Jersey municipalities participating in the Community Rating System (CRS) have the possibility of receiving up to a 45 percent premium reduction. The New Jersey Dam Safety program, new state storm water management requirements, and the development of all hazard mitigation plans, provides CRS credits for all municipalities. We also encourage communities to adopt freeboard elevation requirements, which also provide CRS credits. Many municipalities in New Jersey are small and lack the professional support to fill out a CRS application, or do not have the flood insurance policy base to make it worth their while. However, we do reach out to communities during CAVs, CACs, technical assistance contacts and workshops to promote the CRS. Mapping Assistance. Prioritize mapping projects in New Jersey with consideration of variables such as population, past and projected population growth, adequacy of current maps, development in floodplains, historic flood losses, links to other state or federal projects (such as Corps of Engineers flood protection projects), and changes to floodplains. In coordination with FEMA Region II and the mapping contractor, meet with all local communities in proposed new mapping areas to present the nature of the project and to discuss their priorities. Local and state priorities are developed into project wide scoping materials as a Time and Cost meeting. Such meetings for countywide mapping projects are held two to four times over a two to three day period in at least two central locations. Every community in a county is invited, and NJDEP staff, with FEMA's assistance, meets one on one with each community in order to develop each community's mapping priorities. A letter to each community's Chief Elected Official then verifies those priorities. Priorities are then developed on a county or project wide basis. Participate with FEMA in Community Coordination Meetings upon the completion of any preliminary map. Communities are presented with maps, asked about necessary corrections, and are provided information about the statutory appeals process and map adoption process. These final map meetings are held at county-wide sessions to which every community is invited and NJDEP staff, with FEMA's assistance, meets with every community. Coordination with Other State Programs and Agencies. NJDEP works closely with the Office of Emergency Management, New Jersey State Police, Mitigation Division to assist with mitigation programs such as the Hazard Mitigation Grant Program, the Pre-Disaster Mitigation Program, and the Flood Mitigation Assistance Program. In particular, NJDEP assists NJSP-OEM to review and rank grant applications, and review applications for consistency with floodplain development standards. NJDEP also provides engineering assistance when needed for review of projects in waterways or floodways. The NJDEP Flood Control Section coordinates this with other NJDEP flood related programs, including dam safety and land use regulation programs. NJDEP Flood Control section also coordinates with other state agencies and NJDEP program areas of interest including wetland protection, stormwater management, and coastal zone management. Assistance to Communities in Responding to Disasters.In the event of a disaster that impacts properties in flood hazard areas, NJDEP makes disaster response a priority over other CAP-SSSE activities. In particular, NJDEP works with NJSP-OEM, FEMA and other agencies to provide NFIP-related support and training during and immediately after disasters. 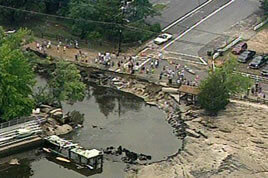 NJDEP performs or assists with community visits in impacted communities. NJDEP also provides support to FEMA as needed in damage assessment, collection and documentation of high water marks, and community outreach. In the event of a large disaster, other contracted activities may be delayed or replaced. For specific information on flood control in New Jersey please contact the Flood Control Section.